According to LG representatives from Poland, the update is already finished and is simply waiting for its public OTA update. Marshmallow is already out for the LG G4, so now it's the G3's turn to receive the latest Android update. The manufacturer has narrowed down the OTA rollout to December 16 to 18 for users in Poland before the rest of the world. Why Poland? LG has traditionally tested Android updates in the country before launching elsewhere, so it makes sense that these same users will get the final release before most others. The Android 6.0 update for the G4 had to be withdrawn at least once during its rollout due to unexpected bugs during the process. Outside of the G3, the G Flex 2 is expected to receive the Marshmallow update as well. Whether or not the older G2 will, however, remains unclear. Android 6.0 offers the usual bug fixes and new features including the frequently requested option to grant or deny permission to individual applications. This can potentially reduce data usage, improve battery life, and prevent spyware from running. Marshmallow also adds native support for fingerprint readers and USB Type-C. 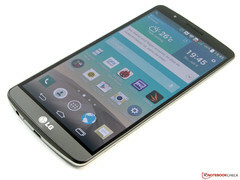 The LG G3 proved to be a great smartphone during our time with the model. Unlike the Galaxy Note 3, however, the smartphone lacks USB 3.0. Newer smartphones are now coming with USB Type-C as standard.